Schoenstatt is a Roman Catholic International Movement that strives to live the Gospel of Jesus Christ through the example and guidance of Blessed Mother Mary. She is at the heart of the movement and is very active in the Schoenstatt shrine, a place, of grace and source of life for our spirituality and work. Schoenstatt is deeply Marian and has repeatedly experienced how this spiritual love opens new avenues to a vibrant relationship with Christ, to the Holy Spirit, to God the Father and to a renewal of love of neighbor and self. Schoenstatt, a German word for “beautiful place,” is a movement that involves lay people, priests, and religious, with special branches for boys’ and girls’ youth and for the sick. 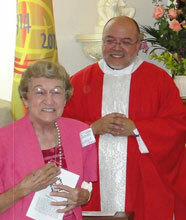 The Schoenstatt Movement offers formation and spirituality in the Catholic faith including monthly group meetings and days of reflection for women, couples and youth serving the Archdiocese of San Antonio and the surrounding areas including Brownsville, Laredo, Del Rio, Victoria, Amarillo and northern Mexico. Schoenstatt serves thousands of visitors to the Cor Unum in Patre shrine, Mount Schoenstatt center and Hope Religious store, located in Helotes, Texas, yearly. In nearby San Antonio, a city Wayside shrine is located on Ave Maria Street. All are open daily through the generous commitment of dozens of volunteers. Our charism as a community might be summed up with these words: love of Mary, love of the Church, love of the mission of Christ for the world and society.